How do you go more deeply when you are writing a paper? It’s one of those catch 22’s, isn’t it. Don’t you think you WOULD engage in more critical thinking if only you knew HOW?! Today I was working with a college sophomore who had just finished writing a draft of an essay for her Italian Culture class. She felt pretty confident that she was addressing the prompt. However, when I asked her if she had any way of assessing whether she was pushing herself to think deeply about the issue in question, she looked a bit confused. ‘Aha!’, I thought, ‘What a great opportunity for one of my 5-minute “mini-lectures.”‘ I whipped out a sheet of paper, and began to draw the image you see above, of 3 levels of questions. Level 1 — Factual. “Who, What, and Where”. In Level 1 thinking, the writer states the facts directly. There is often a “right” or a “wrong” way to answer Level 1 questions. Level 2 — Analysis. “Why, How, So What? !” Level 2 thinking analyzes data, looking for patterns, reasons, motives, etc. This is the beginning of critical thinking in action. Level 3 — Connections. “Now What? !” This type of thinking goes beyond the text, assessing the value of the idea in a broader context. Level 3 thinking can make connections between the idea and other, seemingly irrelevant concepts; furthermore, the writer can make personal connections between the idea and his/her life. These types of questions are the “home run” of critical thinking; they knock your writing out of the park. After I introduced these Levels to Elizabeth, she was easily able to see that her roughdraft — comparing feminism during the Renaissance and the 1960s — was largely a Level 1 essay. She had read the book and was re-presenting the information that she had gleaned. However, she hadn’t thought to look for patterns in feminist thought between the two eras (Level 2) or the impact of the history of feminism on her life today (Level 3). When you sit down to write an essay, take a moment to jot down several questions that you hope to explore in your writing. Make sure that you have questions from each Level, as all of them are important. By asking — and answering — questions at each level, you can unlock your own hidden brilliance, and take your essay writing to a new level. analyze the type of questions your teacher asks, so that you know what kind of thinking they are *really* looking for. 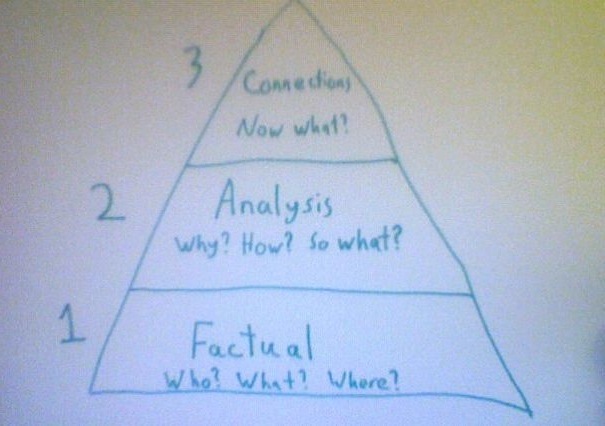 What other places would these three levels of thinking come in handy? Please tell me, below! Many thanks to the web pages at USD497, Mr. Kash, and Noelle Combs for helping me hone my understanding of the 3 Levels of questions. P.S. Did you find this post helpful? You can get more useful tips by signing up for free email updates! I love this post! I just finished reading a book this weekend, and when I went to read reviews of what others had thought about the book, I found them to be mostly regurgitation of information already in the book. I had been hoping to read about what people THOUGHT of the book, and instead I got a lot of “CliffsNotes”. I also noticed that I had been doing this myself in my own writing – so it’s a great reminder to think more carefully and critically! A help in bridging from level 1 to level 2 is to ask, what happened to me as I encountered the factual? When you take time to notice the emotions, memories of past experiences, associations, feelings that come up in you, you get clues to what is significant for you. In working on the best paper I wrote while in college, I got about one page into it, and I was stuck. Falling asleep at it, avoiding it, going for snacks . . . Then I noticed how strongly I was avoiding it. When I asked myself what was going on with that, a whole new possibility opened up for me. I saw many significant connections and patterns (what you call level 2). And implications for my real life (level 3). I would like to say that the paper then wrote itself, but that was not true, there was still work to do, but I felt myself driving to get it done. Got an A-. Thanks, Lisette. Isn’t it fascinating how often we “settle” for regurgitation? I’ve encountered the same problem when looking for book reviews. It does take a little more brain power, though, to push through the resistance to coming up with our own unique ideas. And that extra push is where many people fall short. Yay you, for noticing that you could stand to push yourself a bit in your own writing! Jim, that is so helpful. Thanks! A friend once suggested that I think of feelings as dials/indicators on an airplane, signaling what’s actually happening inside me. When I’m angry, the anger is not the “end” but rather the “beginning”, a signal that a need is not being met, and an invitation to become conscious about this need so that I can work to meet it. I love that you extend this metaphor into intellectual content, not just personal content. Feelings that come up when I’m engaging with content — both the “good” feelings of excitement & stimulation as well as the “bad” feelings of repulsion and numbness/tiredness — might just be indicators of my own brilliance waiting to be noticed and articulated. In fact, it occurs to me that this is the “R” in “ORID”, isn’t it? Haven’t thought about that in a while.